intelligence-based solutions. 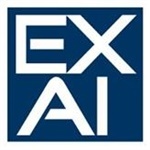 EXAI will be demonstrating their brand and technology at the Internet World 2012 convention on April 24th 2012.
addition, the site builder features a simple drag-and-drop interface allowing users to edit the content, and design a website without having any professional programming or designing skills. Once a user wishes to publish, matching sites for both Facebook and mobile are automatically created.